Dr. Mufaddal Dahodwala is a primary care physician who practices in Santa Clarita. He is board certified in internal medicine, and his clinical interests include primary and urgent care. 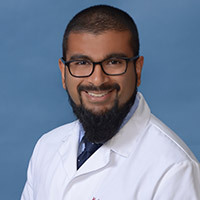 He is passionate about empowering patients to take control of their health, incorporating holistic approaches in primary care, and promoting health literacy through technology and social media. Dr. Dahodwala received both his medical degree and Master of Science in Clinical and Translational Science at Rutgers-Robert Wood Johnson Medical School in New Jersey, where he graduated with honors. He completed his internal medicine training at UCLA, during which time he received multiple teaching commendations from medical students. He earned his undergraduate degree in sociology/anthropology from Swarthmore College in Pennsylvania. When he’s not working, Dr. Dahodwala enjoys traveling, exercising and following his favorite Philadelphia sports teams. He is a member of the Alpha Omega Alpha medical honor society.